It doesn’t get any better than scoring a hat trick of race victories, but that’s what Germany’s Ferdinand GERZ and Tobias BOLDUAN achieved today on day 2 of the 470 Junior European Championship on Lake Balaton. Balaton in Hungary is not known as a high-wind venue, but today the breeze gusted up to 20 knots and the Germans made the most of it, putting the pedal to the metal on their 470 to take the finish gun on each occasion. With the 92-boat fleet of under 21-year-olds divided into three qualifying divisions, other teams enjoyed almost as perfect a day as the Germans. The Argentinian team of Sebastian PERI BRUSA and Santiago MASSERONI scored 1,1,3 to sit just a point behind the leaders in the overall standings. Just another point further back are the reigning 470 Junior World Champions from France, Sofian BOUVET and Jeremie MION. Another French team, Beranger BALZEAU and Mathieu FOUNTAINE, also did well in the windy stuff, slotting in useful scores of 8,1,3. 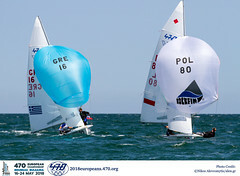 “I think our speed in these conditions is very good,” said BALZEAU , who is looking to make amends for a sub-standard performance at the recent Junior World Championships in Greece where he came 25th in the Worlds. “We were disappointed with that, a very bad regatta for us. Here we have to win.” Currently this team lies in 5th overall. The 21 women’s teams are racing within the 92-boat fleet, and in the race within the race the German girls Tina LUTZ and Susann BEUCKE lead the way, lying in 9th in the overall standings. Not currently posing a threat for the women’s title, but certainly a new team to watch out for in the future is the Italian duo of Camilla MARINO and Claudia SORICELLI. “Our first race today was tragic,” laughed Marino in her effusive Neapolitan accent. “We are trying the 470 for the first time. 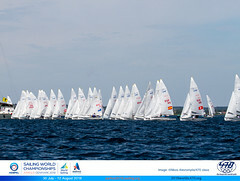 Today was so-so, but the wind was very big, and we are very little.” Currently they lie in 46th overall, but however they may do this week in Balatonfured, 2009 is a year they will remember for the rest of their lives. 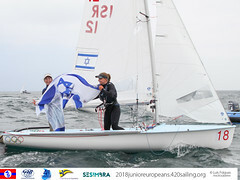 They won a silver medal in the 420 at the Volvo ISAF Youth Worlds in Brazil a few weeks ago, and just a few days ago they won another silver medal at the 420 World Championships in Lake Garda. A few boats returned to the marina with brown-topped mainsails. They had been dredging the shallows of Lake Balaton. Fortunately for the Singapore team, Jovina CHOO and Sara TAN, it happened on the way in after the final race - when the wind gusted over 20 knots. Others were not so fortunate. The Malaysian team of Ku ANAS KU ZAMIL and Muhammad HANAFI NAZARUDDIN tipped over during a race and had to be towed out of the mud by a jury boat, forcing them to retire from that heat. With five races of the qualifying series completed, the fleet will contest just one race tomorrow before they are split into Gold, Silver and Bronze divisions for the final. Perhaps it’s just as well there’s only one race tomorrow, because tonight is disco night in Balatonfured.